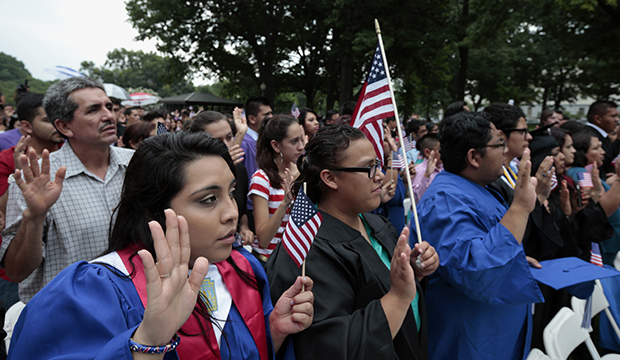 In May, TheDream.US scholarship fund announced a new scholarship program that will allow young immigrants who have received either Deferred Action for Childhood Arrivals, or DACA, or Temporary Protected Status to obtain an affordable college education. Specifically, the new program—the Opportunity Scholarship—is designed for young people from 16 so-called locked-out states that do not offer in-state tuition rates to DACAmented students or that bar such students entirely from enrolling in state institutions. These are students who have, until now, largely been unable to access an affordable college education. According to the College Board, the average published cost for out-of-state tuition and fees at a four-year public university in the 2015-16 school year was $34,031, more than $14,000 greater than the average cost at in-state rates. The Opportunity Scholarship program works around this substantial obstacle to higher education by offering a scholarship of up to $80,000 over four years to help DACAmented students who live in locked-out states obtain a bachelor’s degree at either Eastern Connecticut State University, or Eastern, or Delaware State University, or DSU. This $20,000-per-year scholarship covers tuition, fees, and associated college costs. By partnering with TheDream.US to attract out-of-state students, ECSU and DSU benefit as well by increasing their revenue and ensuring their continued solvency. DSU President Harry L. Williams says that the Opportunity Scholarship “will help the university stay on its current upward trend of growth and sustainability.” Welcoming these out-of-state students and the added revenue that they bring to campus will help protect the ability of thousands of in-state Delaware and Connecticut residents each year to receive a quality and affordable college education. DACA has opened a world of possibility for nearly 730,000 young people who have now received temporary protection from the threat of deportation through the initiative. Nearly two-thirds of DACA recipients are currently enrolled in school, and more than 90 percent of these students report that DACA helped unlock educational opportunities that were previously unavailable to them. The large majority of DACAmented students are pursuing associate or bachelor’s degrees, while nearly one in five are pursuing advanced degrees. Nevertheless, college affordability is a big issue for DACAmented students. And states that do not offer in-state tuition to DACAmented residents—or that bar them from enrolling in state institutions—stymie these students’ ability to realize their full potential. In the absence of changes to state law and policy, the Opportunity Scholarship provides students in these locked-out states the opportunity to reach their potential. While the Opportunity Scholarship is a clear win for DACAmented students and participating states and institutions, it bears noting that locked-out states are losing out on a major opportunity. The U.S. Supreme Court long ago ruled in Plyler v. Doe that all children, regardless of their immigration status, have a constitutional right to a public elementary and secondary school education. Having already invested in the education of college-bound DACAmented students, the decision to offer an affordable higher education to all state residents should be viewed as a further investment in a state’s homegrown talent and its broader economic growth and prosperity. The “brain drain” that results when states adopt laws that deny opportunities to these talented students is not dissimilar to the economic harms that states and communities have experienced when they have enacted other unwelcoming laws. Later this month, the Supreme Court will decide whether the secretary of homeland security’s November 2014 expansion of DACA and creation of the similar initiative known as Deferred Action for Parents of Americans and Lawful Permanent Residents, or DAPA, will be permitted to take effect. If the Court rules in the federal government’s favor, states around the country are expected to benefit dramatically in terms of increased economic activity, tax revenues, wages, and job creation. But even if the initiatives are implemented, it will be up to individual states to adopt laws and policies that help them maximize the projected gains. One simple step that states should take is to ensure that all of their residents have the chance to earn an affordable higher education. Ironically, that is precisely what Texas—the state that is leading the lawsuit challenging the deferred action policies in the Supreme Court—did when it became the first state in the nation to enact in 2001 a law providing in-state tuition benefits for unauthorized immigrants—and when it acted again in 2005 to allow unauthorized students to qualify for state-funded educational financial aid. The entire nation benefits when everyone has access to an affordable college education. That is why states should follow the lead of Texas and nearly two dozen other states that have adopted laws or policies allowing students who meet certain criteria to pay in-state tuition rates, regardless of their immigration status. And that is just the beginning. Legislators in Nebraska—a state that currently offers in-state tuition to DACAmented students—recently overrode the governor’s decision to veto a bill that will allow such people to obtain professional licenses in the state so that they can fully use their education to support their families and wider community. Until such changes are made, however, the Opportunity Scholarship is a smart first step. Other states should follow the lead of Connecticut and Delaware and extend welcome to smart and talented students from locked-out states by participating in the program.